Skinny Singles: How Thin Can You Go? Modern single ropes keep getting thinner and thinner, pushing the envelope of what is possible for a balance of performance and weight savings. Is a “skinny” single right for you, and if so, how thin you should go? The answers depend on the type of climbing you intend to do with these thin single cords. “Skinny” single ropes are those below 10 mm in diameter, and they seem to keep getting thinner each season. 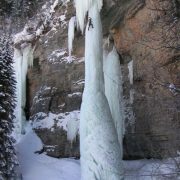 While these ropes typically range between 9.4 to 9.8 mm in diameter, the cutting edge at present is 9.1 to 9.2 mm (the Beal “Joker” and the Mammut “Revelation”). Maxim will have a new 9.1 mm single in 2006, and the envelope will be pushed even further by a new 8.9 mm single that Mammut will market in 2006! These thin single cords typically weigh in around a lean 53 grams/meter (for 9.1-9.2 mm), 58 grams/meter (for 9.4-9.5 mm) and 62 grams/meter (for 9.7-9.8 mm). For comparison, a 9.5 mm, 60 m single rope is almost 1.5 pounds lighter than the equivalent 10.5 mm cord! Of course, you don’t get something for nothing. As common sense would dictate, the thinner a rope is, the fewer falls it can hold, and the less durable it will be. Super-thin skinny cords (e.g. 9.1-9.2 mm) have UIAA fall ratings of about 5, while the fall rating improves to about 6/7 for 9.4-9.5 mm ropes, and to about 7/8 for the more beefy 9.7-9.8 mm skinny ropes. Compared to the typical UIAA fall rating of 11 for a 10.5 mm single rope, one can see that the weight savings of skinny singles is gained at the cost of fall rating and durability. While a few of the skinny singles are UIAA Sharp Edge rated, by far most are not. At present, only the Beal Joker 9.1 mm is UIAA rated for use as both a twin and half/double, as well as single. Using this rope as a twin increases the fall rating substantially. So, how do you decide if a skinny single is right for you, and just how thin you should go? 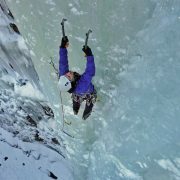 The key factor in choosing will often be whether you intend to use the rope to climb long, wandering, alpine-style routes, where rope drag will be an issue, or whether you intend to mostly climb routes that are linear and don’t wander, such as typically found at the local ice or rock crag, or cliff. Another important factor is whether you intend to use the rope for hard redpoint/onsight attempts, or for working routes and/or toproping. 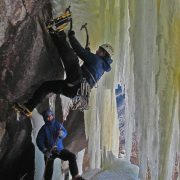 Skinny singles are a solid choice for rock/alpine/ice climbers expecting to encounter many pitches and looking to save substantial weight. They still offer a solid safety reserve in terms of falls rating, and on many climbs, any rope drag can be controlled by careful use of longer slings (if the skinny single is also rated as a half/double, it can also be used in this format for any wandering pitches). They are often a great choice for climbers working hard routes for redpoints or onsights, where you don’t want extra pounds holding you down. On the flip side, they are probably not the right choice for working routes or doing a lot of toproping, where a thicker more durable 10+ mm single rope is going to shine. 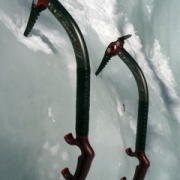 And they are probably not the best choice for use on any type of route, whether alpine, ice, or rock, that is going to wander to the point where the only way to control drag is with a double/half rope system. As for how thin to go, just remember that the thinner the skinny single, the less falls it will hold and the less durable it is likely to be. So, most climbers considering their first thin cord will likely want to consider something 9.5 mm and up, saving the super-thin cords for redpointing, etc. If you decide to grab one this season, Beal, Esprit, Edelrid, Maxim, Mammut, and PMI all offer a range of great skinny single ropes. Get out there and climb safe! Was very pleased to find this website.I would like to thank you for this nice read!! I definitely happy every little bit of it and I have bookmarked to check out new stuff you post. How to make a V-tread Site Make Over!